Ease Up specializes in the treatment of: Muscular aches and pains, postural correction, back pain, headaches, shoulder pain, reduced flexibilty. Medial Epicondylitis is also known as “Golfer’s Elbow” is a condition where micro-tears occur in either the musculotendinous junction (muscle to tendon attachment) or tenoperiosteal junction (tendon to bone attachment) of the flexor muscles, resulting in pain and inflammation of the affected tendons. During repetitive stress kinds of motions such as keyboarding there is a different kind of stress to the muscles and joints. 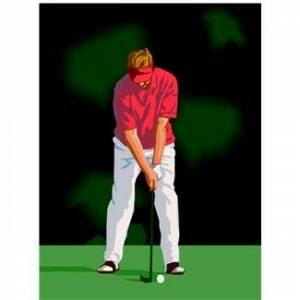 In golfer’s elbow, when using the muscles to grip all day long, the flexor muscles are being tensed all day long. This is a muscle group that is short and tight and does not have a lot of elasticity or “give” to it such as the extensor muscles. When it forced into hyperextension this causes a lot of stress to is. The weakest point of this muscle group can become inflamed. Common treatment practices include long-term rest, over-the-counter anti-inflammatory medications or cortisone injections, but all of these treat the symptoms, not the actual condition. Better long term solutions in order to treat the cause of the dsyfunction is physical therapy or massage therapy with on-going regular sessions. By performing a simple massage, stretch and exercise routine, you can eliminate Golfer’s Elbow in a few, short weeks. There are micro tears at the medial epicondyle which you will want to relax. You want to mildly stretch these muscles. You still want to do some stretching and flexing in order to stretch and strengthen these muscles. You can massage the medial epicondyle which is the inner part of your lower arm. This will help create length in the flexor group. When these muscles are relaxed and not so tight, then this will reduce some of the pulling on these muscles. The other massage move you can do is to stretch your wrist out and then flex your thumb back in order to get some stretching on the other parts of your forearm . Do three sets of four of these exercises. You also want to stretch your pronator group muscles. Bend your elbow towards you and stretch your thumb towards you. Another movement you can do is to extend your arm out and bring your forearm towards you. Extend your arms and hard towards you and away from you in order to take stress away from the medial epicondyle. Ulnar deviation is another exercise you can do. Extend your arms out and then rotate your wrist turning from one side to the other. This will strengthen your pronator and extensor muscles. Another exercise you can do is a palm-up with elbow moving exercise. Just extend your arm out and then bringing your palm toward you. This will relieve compression and muscle tightness. You want to do a few sets of these but not overdo it as your muscles are regaining strength and mobility. It is best to contact a bodyworker that is trained in pain management or a health care provider in order to properly treat and diagnose your condition. Be wary of any provider that simply wants to prescribe pills or a cortisone shot in order to manage the symptoms of golfer’s elbow which doesn’t deal with the root biomechanical and anatomical cause of the pain. This entry was posted in Massages for Golfers, Treatment of Elbow Pain and tagged Massages for Golfers, Massages for Golfers - Treatment of Elbow Pain, Treatment of Elbow Pain by EASEUP. Bookmark the permalink.